A phantasm of self, cloaked in black ambience through a traverse of the inner; the worlds built within us, the banshee of dissonant human experience. An industrial drone of the classical; our bodies as gothic churches, our hands the tools of creation, the strength to build and the strength to destroy – a spectral echo within the auditory expression. The struggle of the self and monochromatic gloom, the beauty of personal growth through pain. The heavy rain and pace of flowing blood, an instrospection: a vulnerability of reflection in sound, tenderness in opening ourselves to the imagining of others. A collective consciousness in exploring the self through sound, and the ghosts of others; a journey through the heart-beat depths, with the accompaniment of glittering souls in the underworld chill. The other-world of astral mysticism, an auditory afterlife; down the blackened paths of self-exploration; the tickling cold breath and chill of vulnerability as we allow others to see us, and in turn see them. To reinterpret the resonance of personal movement, the layered sounds of one within the other. An expansion on the September release of Okovi, Zola Jesus allows a closer look into the shroud of her underworld aesthetic, the deeply personal introspection within the shadows of herself. Okovi: Additions features four previously unreleased original songs, as well as a tender vulnerability present in the four remixed tracks from Okovi. 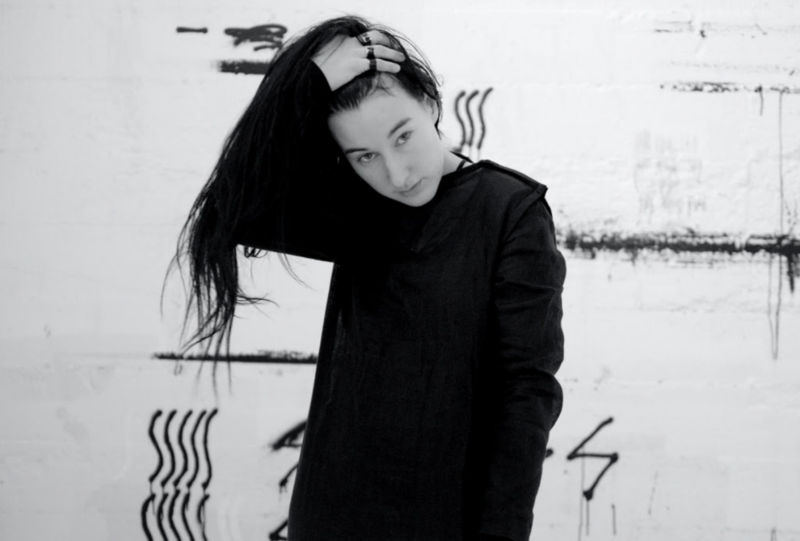 Zola Jesus; producer and vocalist Nika Roza Danilova, explores the heaviness of the shadow self and cold, yet beautiful reality of human existence and her own journey in Okovi – the expansion of four unreleased original tracks in Okovi: Additions allows us further insight into the spectral realm of Zola Jesus. With an additional four remixed tracks, the remix artists build foundations of their own personality while weaving them seamlessly within her sound, an intimate experience in the collaboration of perspective and collective experience. Featured on the Okovi: Additions are remixes by American record producer and composer Johnny Jewel, experimental avant-pop artist Katie Gately, Randall Dunn and Aaron Weaver of American black-metal mystics Wolves In the Throne Room and Joanne Pollock: formerly one half of Poemss, with Venetian Snares’ Aaron Funk. Okovi: Additions allows a playground of new atmospheres, experiments in auditory perception and true to personality. Spectral greeting in metallic ambience, a cacophony of phantasmagoric glitches and texture introduce ‘Bound‘; the striking confidence of heavy, dark distortion – a haunting, industrial depth and weight within a driving synth melody. Shock cold fingertips to the touch, dense steel and drone – a rise and fall in whirring progression, a ghostly drama in personification of this original track; Zola Jesus’ distinct avant-garde // avant-pop, haunting yet powerful vocal style accompanies the engulf of warehouse gloom; the melancholia of minor timbres building as a foundation – a spherical haze, excited embrace of upbeat electronics, turning of the cogs in the harsh polish of gloaming and a mechanical urgency of dance. The soaked depth of vocal tone brings forth a melodrama; both floating in avant-electronic goth – the moody dark of textural ’80s synths and drenched reverb – to the modern influence of catchy pop with a dreamlike experimental twist. An unearthly melody charms a submersion of delay; chilling in echo as Zola Jesus’ moving, soulful vocals hover as specters in the ghostly ambience of ‘Bitten Wool‘. Another of the original tracks on the album, the haunting reverb soaked synth flows with a slow and steady pace; an immersive twilight realm of introspection and calm, yet passionate exploration of sound. Vocals as the forward progression, a glittering dark ambience and traverse of the angelic in gloom, as Danilova builds an other-worldly electronic soundscape. ‘Ash to Bone‘ is the first remix on the Okovi: Additions. A remix by multi-instrumentalist, record producer and composer Johnny Jewel; a change in pace and tone, Jewel’s remix has retained the evocative, sombre personification of Zola Jesus’ experimental soundscapes and melancholic vocals – Jewel has added unique genre-bending textures, playful in nature; a loving blend of smooth, steady and atmospheric chillwave; the layers of hazey synth and gentle percussion flow tenderly with angelic harmonies, an engulf in the traverse of sound and a soulful relationship between the artists personalities; Jewel’s dreamlike remix of ‘Ash to Bone‘ is a seamless exploration of the way in which each artist creates, and the world built in that journey. The official music video for Jewels’ ‘Ash to Bone‘ remix is available for viewing, directed by Zola Jesus herself with the help of Jenni Hensler. Remixed by Randall Dunn and Aaron Weaver of Wolves In The Throne Room, the third remixed track ‘Exhumed‘ grasps the monochrome glitch of Zola Jesus’ aesthetic, avant-garde imagery glimmering with beauty and melancholia – a stunning, emotional horrorshow, simmering in genre coalescence with Dunn and Weaver’s heavily distorted, haze of fuzz and layered guitars – the driving blast of black-metal percussion; an anthemic siren song as Danilova’s vocals drown, gracefully into a black, beckoning depth – an anxious heart-beat in the blood pressure soundscape – pulsing forward with passionate, driven energy as the vocals seep in and out of the delicate, dark world. Cradled by intricate coats of texture, the powerful clarity of Zola Jesus’ vocals are stitched with effects, woven in and amongst themselves creating a spectral aura of being and sphere of moody closed-eye immersion. Okovi: Additions delves further into the atmospheric worlds created by Zola Jesus, unafraid to experiment and traverse through beautifully haunted electronic soundscapes; breaking genre expectations with each new layer of sound, each new perspective in an industrial, gothic playhouse. The combination of haunting melancholia and upbeat avant-pop allows for full immersion from different angles; Zola Jesus’ aesthetic confident in her phantasmal style and tone, combined with an open, playful and experimental approach in perspective, collaboration and reinterpretation between artists – the creation of soundscapes as an individual voice, and the creation of worlds with others. Okovi: Additions furthers our exploration of sound with Zola Jesus, a twilight-darkly journey through her artistic vision and the reshape of aesthetic; the evolution of collaboration, shining through the unique stylistic personalities in the gloaming wonderland.